How are eBytes made? - Learning Nexus Ltd.
Last year we released our brand new eBytes range to the world. eBytes are our very own micro-learning range all of which are short videos around 2 minutes long. Studies have shown that learner engagement and knowledge retention are most effective in the first two minutes; therefore, we think eBytes are the perfect way to absorb learning content effectively. eBytes begin their life in the hands of our Learning Designers. After deciding a topic, the first thing to do is research the chosen area. This ensures that everyone is fully clued up and ready to go, meaning they can get across the main learning point in one short video. The next step is to choose a theme! For example, our eBytes on loan workers are set in space, which reinforces the main message and of course makes it a lot of fun! Once the research and theme have been perfected, the team get to work on writing a script, this stage is where the one learning objective is decided. This is then whisked off to our voice artists where they begin to record the script. It’s this stage where you can see the bones of the eByte coming to life. This stage is our favourite! The animators get to work plotting out every scene. They consider everything from the movement, the staging, how each frame flows to the next and of course, which monsters will suit that eByte the best. For instance, in Rage Gauge it was clear The Big Happy would be the perfect monster to use but sometimes it’s almost too hard to choose! 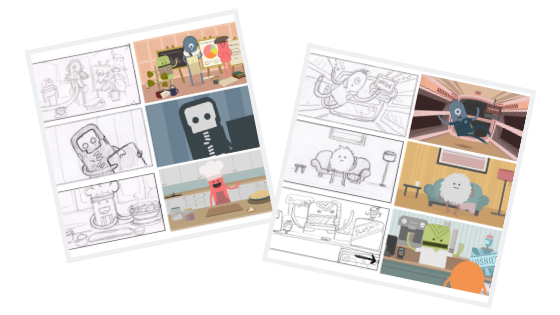 Each storyboard is drawn out and written on paper – the quickest way of getting out those ideas before they’re forgotten! This also allows the team to use their creativity to the max by sketching out the scenes and making sure they fit well with the script. 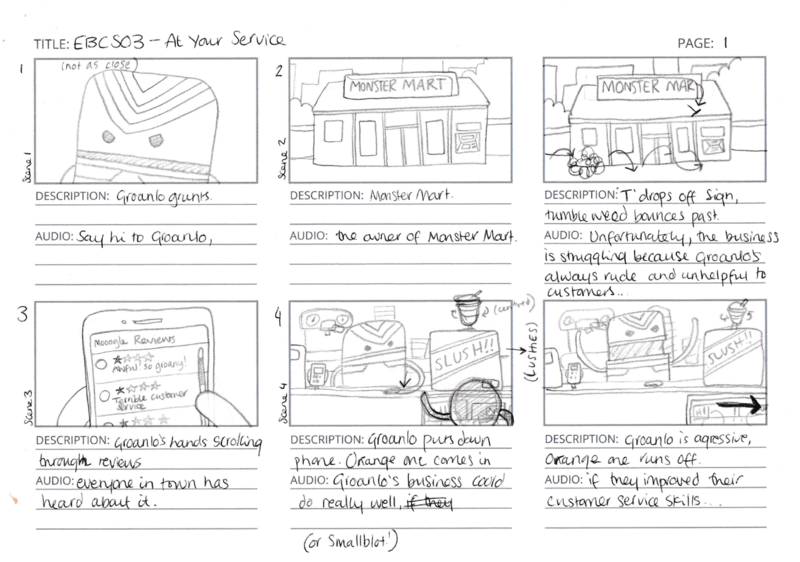 Once the storyboards are completed on paper its time to make them digital. The team start to draw each frame into illustrator. 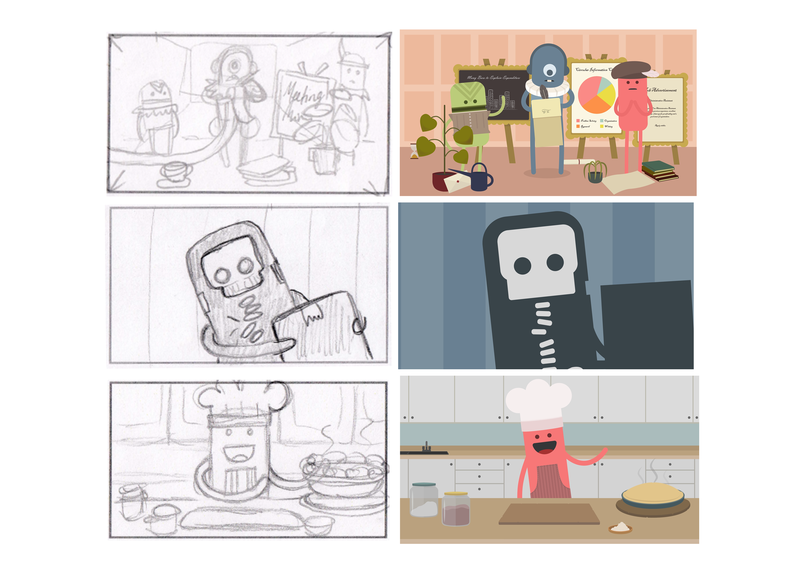 See below how the team can turn a simple sketch into the real thing! It’s at this point where the eBytes truly come to life. The animators take the digital drawings and import them into After Effects along with narration. The flat drawings of the monsters become fully moving and breathing beings with all their own personalities; even adding effects like Groanlo’s famous grump! 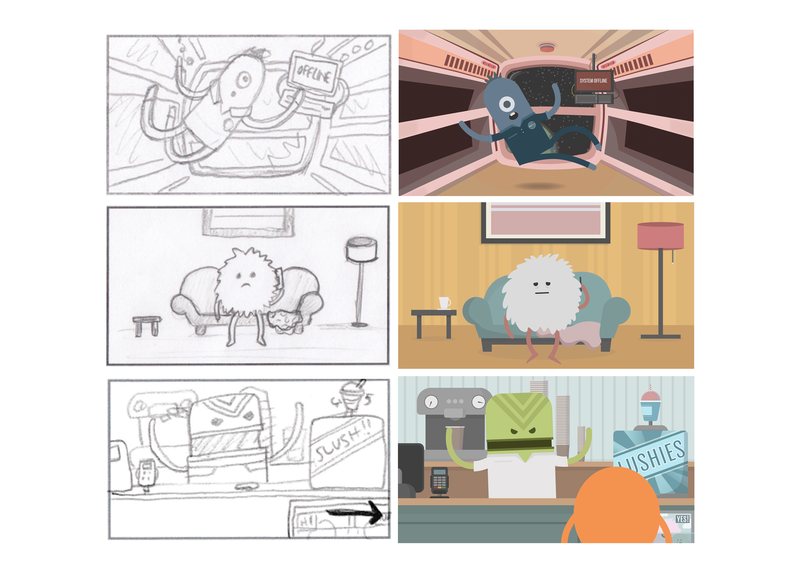 Sometimes with eByes, there are challenges that you’d never think of, such as, how do you animate a monster with zero gravity, but the team always do an excellent job – even if we do say so ourselves! As you can see, there’s a lot that goes into the making of these monsters from writing the script to the finishing touches. One eByte takes around 40 hours to make from start to finish, that’s a lot of time, love and care! How can you use eBytes? • Use eBytes as part of an induction process for new starters – what a great first impression! We couldn’t possibly make a learning topic to cover everybody’s requirements (we do try though). While we already have a generous selection of eByte topics, sometimes you need something a little more made to measure. That’s why we make eBytes ‘made-to-order’. In other words, if you need to create an eByte to highlight company policies for new starters, or to teach staff about GDPR, we can help you. You can use our infamous monsters to convey your message in a condensed, effective and creative way. We thought you might be. Contact us to get your hands on a free eByte by emailing hello@learningnexus.co.uk. Also, check out eBytes page for more details and video clips.